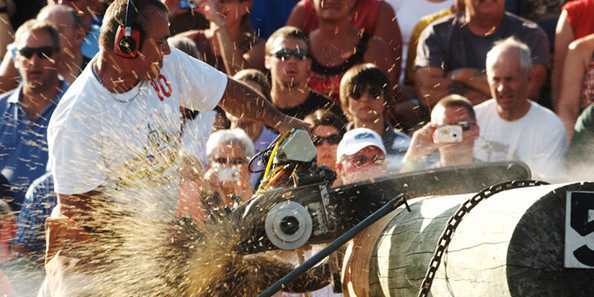 Hayward hosts the 59th annual Lumberjack World Championships July 19-21, 2018! The Lumberjack World Championships began in 1960 as a way to acknowledge the rich history of the logging industry across the United States. Once again, over 21 events will offer international competition, showcasing sawing, chopping, speed climbing, log rolling, boom-running, and more! More than 100 lumberjacks and lumberjills vie for more than $50,000 in prize money, making this one of the largest paybacks for lumberjack competition in the world – and of course, world records in these events could be set – they often have! Up to 12,000 spectators enjoy the action in Hayward. Opening night – Thursday, July 19th – is Mountain Dew Family Night, with special family pricing for admission ($45 for two adults and up to four children) and other specials. Other ticket packages run around $53 for three days’ worth of admission. Family Night! Free Foam Axes for first 250 Kids! 3:30pm Happy Hour in the Swinging Awe Beer Garden! 8:00am Birkie’s Lumberjack 5K Run Walk – Register Now! 1:30pm Live Music in Swinging Axe Beer Garden!